The Triptych Collection is an effort to explore three elements required in causing transformation: integrity, will, and commitment. I have used horses in sport to symbolize this exploration because I have a fascination for the animal and what part he plays in our evolution, both as the symbol of beauty, grace, and power in nature and as a vehicle for man’s aggression towards others in war before mechanization. 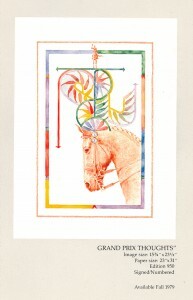 The horse, as I see it, represents the highest, and at the same time, the lowest aspects of our behavior. The dichotomy is perhaps what gathers my fascination. 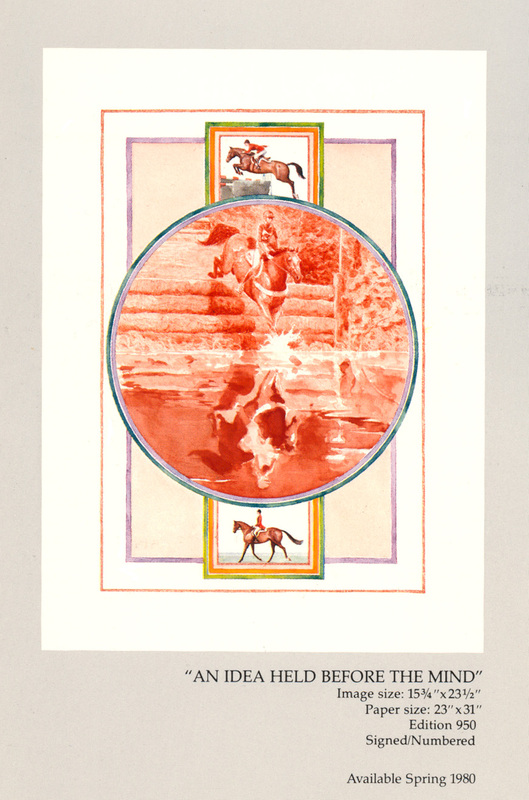 The sports depicted are dressage, jumping, and the three day event. The three day event includes a modified level of dressage and jumping but the emphasis is on the cross country phase on the second day. 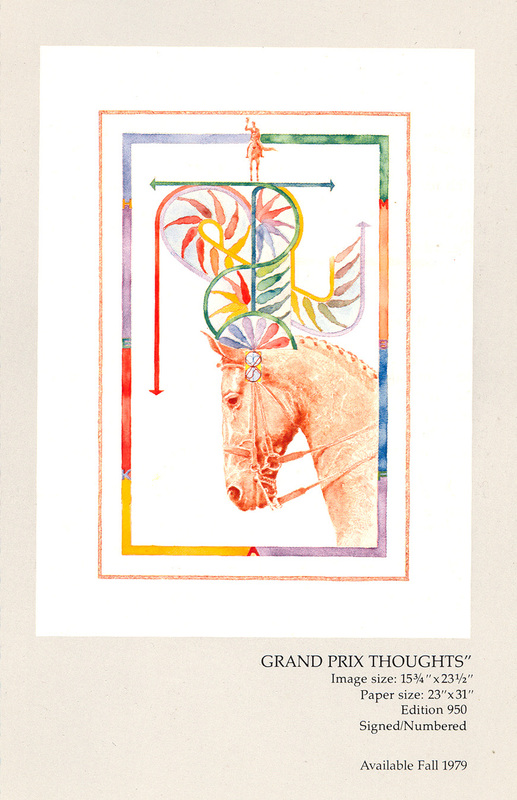 The Triptych Collection, though, is concerned with the three highest levels in these sports, Grand Prix level dressage, the Puissance in jumping, and the advanced level of the Three Day Event, as competed by the international teams. 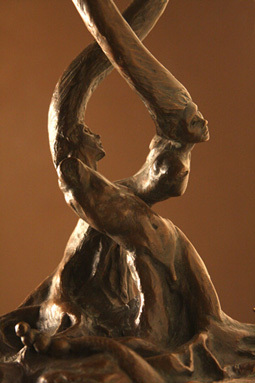 work and to transmit that joy into his movement. 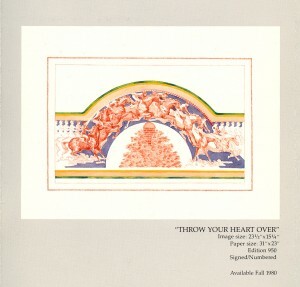 In the painting, the movements he may be asked to do inside the arena. The plume-like shapes are actual horse-shapes performing turns-on-haunches and turns-on-forehands and moving on three tracks. The miniature horse and rider salute you, the judge, with total self-assuredness. All this takes place in a dressage arena where the letters are the standard indicators of take-off points of command. “Throw Your Heart Over” is a horse and rider scaling a 7-foot Puissance wall, one class offered in open jumping where a collapsible wall is raised until the competition is won by one contestant by process of elimination. To face and overcome such a barrier must be an act of will. Once I was told as a child, in jumping a fence you must throw your heart over first and then your horse will follow. If the horse stopped in his last stride before take off, and the rider didn’t go over the jump alone, that rider did not throw his heart over. 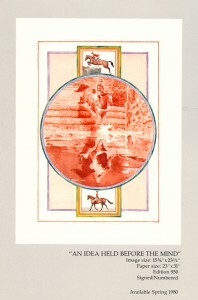 “An Idea Held Before the Mind” encompasses all three sports, but the large circle spotlights the cross-country phase. Here the horse and rider must perform the grueling task of traveling approximately 12 miles at various speeds before they even approach a 4 -5 mile course with obstacles that seem impossible to overcome to a novice. They include jumps uphills, downhills, into and out of water, ditches, banks and slides, all done under a time limit and penalty points for refusals, etc. falling off, three refusals, going off course, or being assisted in any way is paramount to elimination. In this painting, I questions what kind of commitment it would take to win such a competition. Perhaps it is a person who holds an image of herself at some point in the future, in this case, performing the third day. In the reflection in the water this personal also holds an image before her mind, only backward in time, to the first day, the dressage test.